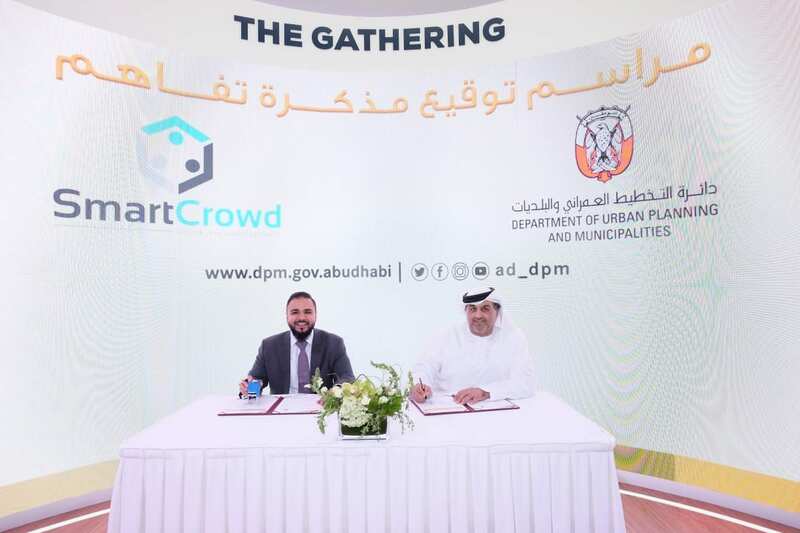 The Department of Urban Planning and Municipalities have entered into a Memorandum of Understanding (MOU) with Smart Crowd Holdings Limited on April 16th, 2019 in the presence of His Excellency Mohamed Al Khadar Al Ahmed, Executive Director of Strategic Affairs Sector, at Cityscape, Abu Dhabi’s largest real estate exhibition. Smart Crowd is an innovative real estate crowdfunding platform that allows individuals to invest in partial ownership of real estate, lowering entry costs into the real estate market. The platform is regulated by the Dubai Financial Service Authority (DFSA). The agreement, signed by His Excellency Mohamed Al Khadar Al Ahmed on behalf of H.E. Mubarak Obaid Al Dhaheri, Undersecretary of the Department of Urban Planning and Municipalities and Mr. Siddiq Farid, Chief Executive Officer and Founder of Smart Crowd Holdings Ltd. is a result of the Department of Urban Planning and Municipalities’ aim to encourage the private sector to participate and innovate in Abu Dhabi’s real estate market, and promote economic growth in the country by encouraging real estate investment through collective ownership. The MOU will allow both parties to explore the possibility of implementing a similar model of collective or joint ownership in the Emirate of Abu Dhabi, and develop proposals on the implementation of such a model in accordance with the laws and legislation in the Emirate. “We are pleased to work on the proposed partnership with Smart Crowd. We hope to work together with the private sector to develop innovative ideas and mechanisms in the field of property investment in line with the Department’s interest in the growth of the real estate sector in Abu Dhabi,” said His Excellency Al Dhaheri. Smart Crowd has opened the real estate market to a new generation of savvy investors, shifting the traditional real estate investment model. Interested investors simply need to register with Smart Crowd, choose a vetted investment property, and invest a fraction of the property’s value. Once the investment is made, ROI in the form of rental income is almost immediate. “Our aim is to open the doors for individuals who want to invest in the real estate market, but who may see the initial capital investment as an obstacle. We are excited to bring this idea to the Abu Dhabi real estate market, and are thrilled to work with the Department of Urban Planning and Municipalities to do so,” said Mr. Siddiq Farid. The MOU will promote the exchange of experiences and best practices in real estate investment through shared ownership. Smart Crowd is a digital real estate investment platform which provides the opportunity to buy and sell shares in properties, reducing barriers to entry to low-middle income households to build financial assets and generate investment income. Smart Crowd caters to most people who find it hard to get on the property ladder to build a diversified portfolio and “unlock their wealth potential”. In April 2018 Smart Crowd became the first and only financially-regulated digital investment platform in MENA. We provide users with active share management, transparency in their property investment, low investment cost and very low minimum investment levels. Smart Crowd Holdings Ltd. (Smart Crowd) is regulated by the DFSA. Smart Crowd’s Licence is a restricted ‘Innovation Testing Licence’ and it is restricted under the DFSA Licence to testing its platform. Due to the limited nature of its Licence, normal Client protections may not apply and Clients may have limited rights if they suffer as a result of taking part in testing. Smart Crowd is part of the region’s leading fintech accelerator, DIFC’s Fintech Hive, and has won numerous awards including Accenture Innovation Award at GITEX 2017, Sharjah Entrepreneurship Festival Pitch competition, and Smart Dubai’s Global Blockchain challenge. The digital real estate investment platform, Smart Crowd, has won “Fintech of the Year” at this year’s Arabian Business Technology Awards. The awards attract participants from throughout the region, and recognises only the best in the field of IT. In a pool of highly competitive nominees, the Dubai-headquartered Smart Crowd was selected as “Fintech of the Year” owing to its innovative approach to real estate investing and its speed to market. The platform’s innovative crowdfunding model has enabled a new generation of investors to participate in the real estate market, shifting the traditional investment mindset. Smart Crowd’s model lowers barriers to entry for investing in the real estate market by eliminating the need for large lump-sums of cash, increasing diversification and practically eliminating bureaucracy traditionally associated with purchasing a property asset. With Smart Crowd, users simply need to register, choose a vetted investment property, and can invest a fraction of the property’s value. Once the investment is complete, investors can start seeing a return on their investment in the form of rental income in proportion to their ownership. The Fintech of the Year award is the latest in a string of wins for Smart Crowd. Smart Crowd was selected in the region’s only fintech accelerator, DIFC’s Fintech Hive, and in 2017 won the Accenture Innovation Award at GITEX and Best Startup at Sharjah Entrepreneurship Festival. Smart Crowd was also the runner-up at Smart Dubai’s Global Block Chain Challenge at the inaugural Future Blockchain Summit. In 2018 Smart Crowd became the first and only financially-regulated digital real estate investment platform in the MENA region. 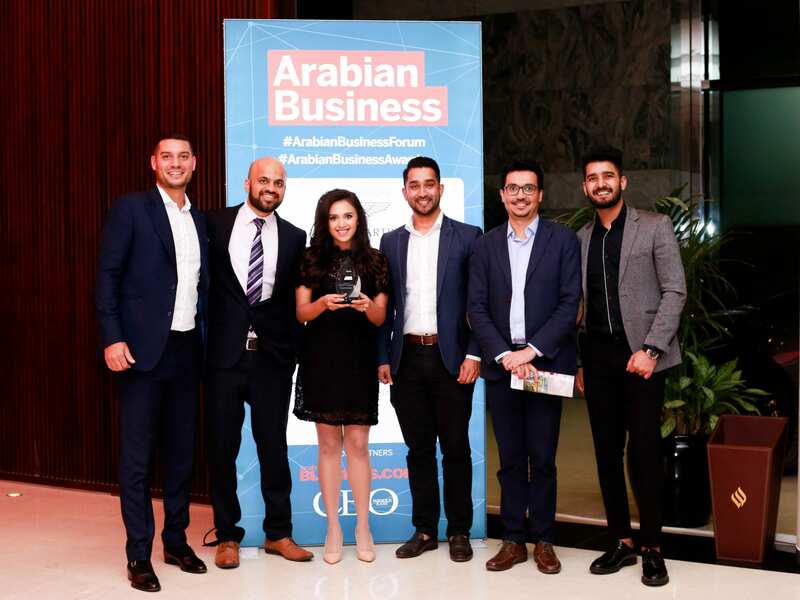 The 2019 Arabian Business Technology Awards will take place at the Jumeirah Emirates Towers Hotel on Sunday, March 31. Smart Crowd Limited (Smart Crowd) is regulated by the DFSA. Smart Crowd’s Licence is a restricted ‘Innovation Testing Licence’ and it is restricted under the DFSA Licence to testing its platform. Due to the limited nature of its Licence, normal Client protections may not apply and Clients may have limited rights if they suffer as a result of taking part in testing. Smart Crowd is part of the region’s only fintech accelerator, DIFC’s Fintech Hive, and has won numerous awards including Accenture Innovation Award at GITEX 2017, Sharjah Entrepreneurship Festival Pitch competition, and Smart Dubai’s Global Blockchain challenge.